Most people reach my site from Google when they’re looking for suggestions for an around the world packing list. It’s a list of everything you might want to carry to get through day to day travel, nice meals out, rain, snow, and trips to the beach. Having traveled now for five months I wanted to give an different idea than the overkill expensive packing lists: what’s the smallest possible packing list for long term travel? 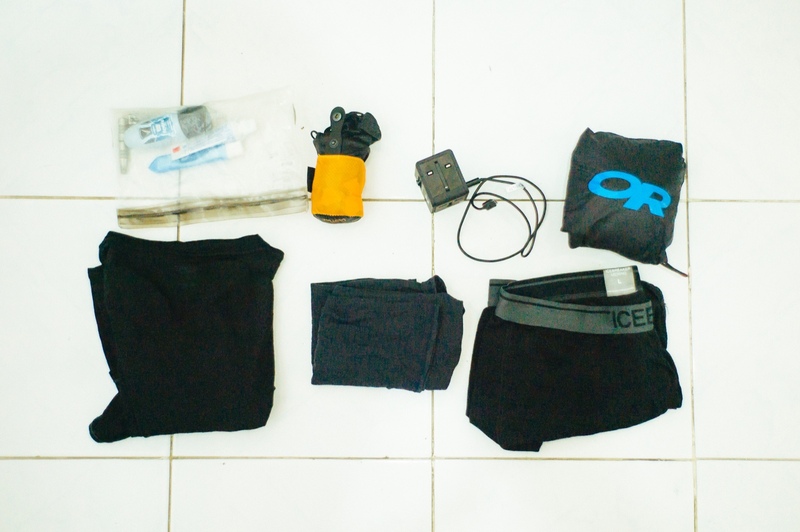 Today my pack is around 5 kilos and 19 liters, but the pack still contains professional camera equipment, a laptop for photo editing, and clothes for almost any climate. Given the choice today I’d probably bring even less stuff — especially the specialized shoes, down jacket and rain jacket — and just pick up disposables on the road. So what’s the lowest you could go? What’s a good packing list for between one day and three months on the road? 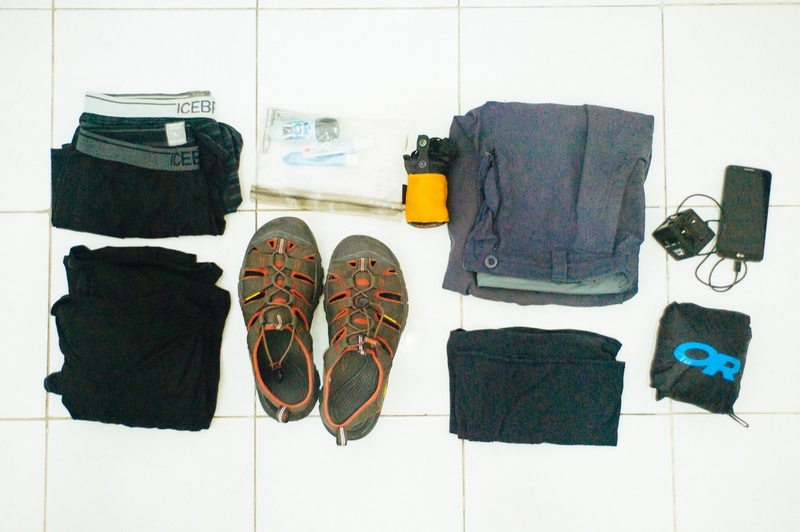 For the bare minimum packing list I think you would want the clothes you wear day to day, a change of underwear and shirt, something for sudden cold or wet weather, shoes, toiletries, and a smartphone. Literally the whole packing list could be two shirts, two pairs of underwear, a pair of pants, a disposable poncho, a hat, shoes, earplugs, a toothbrush, and a smartphone with its charger. Everything else is optional — and you’ll be wearing more than half of this at a time so it all fits into a very small backpack. What’s this look like in practice? I’ve cut my pack down to the minimum for these pictures. The pictures include an ultralight rain jacket, but you can just use a disposable poncho. Here’s everything together. Clockwise from top left: two pairs of underwear, toiletries, an ultralight backpack, pants, phone and universal outlet charger, rain jacket, wool buff, shoes, two wool t-shirts. Here’s what actually gets carried in your pack most of the time. Clockwise from top left: toiletries, the pack itself, universal USB charger, rain jacket, change of underwear, wool buff, change of shirt. What’s great about this is that you don’t even really need a backpack. It would all comfortably fit in a waist pack. You would trade the flexibility of always having gear for any situation for traveling ultra light and having freedom to not worry about things getting stolen, not worry about packing and unpacking, and an incredible ability to focus and pay attention to the places you visit. Shopping on the road is a ton of fun anyway, so finding gear as you need it isn’t as much of a burden as it may seem. This amount of gear would be comfortable to carry all day. You’d never need to check a bag or pull out a laptop for airport security, you would never need to use a hostel or train station locker, and you would still have a little computer with you for reading books, accessing the internet, writing emails home, and sharing pictures. Everywhere I’ve visited has all of this stuff for sale for way less than you can pay in the United States. Unless you really want to have high quality stuff that doesn’t break you can just ignore my specific gear advice and buy cheap stuff on the road. It won’t last as long as high end gear but you also won’t feel bad leaving it on the side of the road when you’re done with it. You don’t need $100 shoes, you can buy $20 shoes in each country for each purpose and then get rid of them. The most expensive thing in the pack is a $350 Android phone, and the $100 junker Android phones that you can buy anywhere in the world will be just as good. For shoes I suggest only bringing one pair and consider either dress leather shoes or [ruggedized hiking sandals](). The hiking sandals are admittedly ugly, but are comfortable for hours of walking, look reasonable either in shorts or with your pants rolled up, dry quickly, adapt to almost any weather, and don’t require socks. A lightweight rain jacket or poncho will keep you reasonably warm for any excursions outside down to about 50 degrees Fahrenheit. When things get really cold you can wear both of your t-shirts at once. A good wool hat will do a great job keeping your head warm ,acting as a sleeping mask at night, or as a sweat band in hotter climates. An entirely optional but valuable addition would be headphones and earplugs. Because most of your clothes are made of wool they will smell good every day, and you can wear them for a week without washing them. My favorites are Icebreaker underwear and [t-shirts]() (other brands tend to discolor).Your pants aren’t made of wool, but once every two weeks you can wash them in the sink or shower and hang them to dry overnight. If you frequently stay in hostels and don’t want to wear underwear around while your pants are washing consider getting shorts. I really like my wool Icebreaker shorts for wearing to bed, they are very comfortable, but a swimsuit does the job fine and has more than one use. An external USB battery for recharging your phone on the go. This comes in really helpful if your phone is also a book, a camera, and your internet terminal. If you use an LG G2 like I do this battery will get you through four straight days of constantly using the phone, or almost a week of light usage. That’s four days without having to plug anything in and it’s really tempting. A world-wide prepaid SIM card from TMobile. This means there is no hassle being without internet or finding SIM cards in foreign countries. A little travel medicine kit with ibuprofen, immodium and basic antibiotics. Extra travel-sized passport photos for getting visas in certain countries. I’m very tempted to make this my travel kit for a while and see how it works. If I was going somewhere for only a week and wasn’t planning to blog I’d definitely bring this pack. As it is, I pay my bills with writing and photos so it’s hard to justify, but for everyone else it would be a great way to eliminate distractions and connect better the places we visit.